Just when I thought, especially after relentlessly pounding its now familiar streets with my sister over the past week, that I had pretty much seen everything there was to see in the City, an outer borough excursion showed me that New York as a whole has so much more to offer and plenty of surprises still in store for me. Laurie and I headed to Brighton Beach, at the very end of the Q line in Brooklyn, this past Sunday. It is better known as "Little Odessa" because its patchwork of residents are primarily from former Soviet Union territories such as the Ukraine and Latvia. We landed in a bustling market street as soon as we exited the subway, filled with people shoving each other (and us) out of the way to get to the best fresh produce and haggling for them in Russian. In fact, we hardly heard any English being spoken ... the journey from the Upper West Side may have only been 20 miles but culturally we were thousands of miles away and I regretted not learning how to say "hello" and "thank you" in Russian ahead of time (the two expressions I always make a point of learning in the native language of whichever country I am visiting). After fighting our way through busy Brighton Beach Avenue, we opted to have lunch at Cafe Glechik, a traditional eaterie frequented almost exclusively by Russian locals. 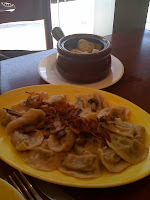 We sampled a plate of pickled vegetables (incredibly garlicky and including pickled watermelon which was surprising to say the least), pork Pelmini and potatoes and mushrooms Vareniki (both are types of dumplings) to the nostalgic sounds of gypsy music - making the experience even more "out of this world", especially when the bill came to just $7 per person for what was a very generous meal. 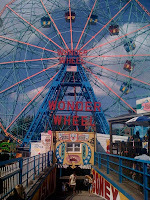 We walked off lunch by heading towards the sea and the boardwalk which leisurely stretches to Coney Island. The latter has never been on my list of places to see - I had very low expectations and anticipated a run-down and tacky amusement park, possibly full of shady characters. But perhaps it was the strolling in the sea on the way there (which made me feel on holiday), or the brilliant sunshine or maybe the company (Marie and her friend L had joined us by then) ... whatever it was, I was won over by Coney Island. Sure it is indeed a little tacky with its arcades and fun rides and there are plenty of colourful characters meandering about, but it all made for fantastic people watching. It was also surprisingly clean and friendly and I loved the small booths lining the boardwalk, each playing different types of music that people danced to in broad daylight without an ounce of self-consciousness. My favourite was the open air karaoke which made American Idol's worst contenders almost sound talented. A bumpy ride on the Wonder Wheel was (quite literally as it stands 150ft tall) the high point of our visit as it offered unbeatable views of the Ocean on one side and the distant Manhattan skyline on the other. I may well have become one of those annoying Manhattanites who dread leaving the safety and familiarity of their tiny island, but after this taste of an almost entirely different universe I am more determined than ever to stop whinging about the long subway rides and absence of taxis and get to the business of seriously exploring New York's more culturally authentic boroughs. 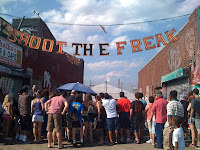 * While the "shoot the freak" photo may alarm some of you, fear not - it's only a paintball game ... catchy name though.